S5 is a superior ON /OFF helmet made in Airoh’s Highly Resistant Thermoplastics (HRT). S5 is designed for hybrid use in three different configurations, i.e. with peak and visor for all-terrain use, with peak and no visor as MX helmet, or with visor and no peak for on-road use. A special focus was put on the design of the peak, which can be adjusted, removed or lowered down to come into contact with the visor. This feature significantly reduces the helmet volume and allows it to be easily placed into the motorbike under-seat compartment and/or storage case. 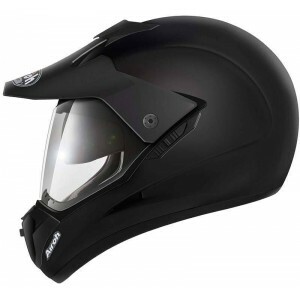 A panoramic visor equipped with a lock system, a practical inner sun visor and an adjustable chin ventilation system are other key features of this helmet, for riders to cope with any challenge.